Of my friends/colleagues, I know a couple of former vegetarians (E & A), a current vegan (S) and a current vegetarian (R). 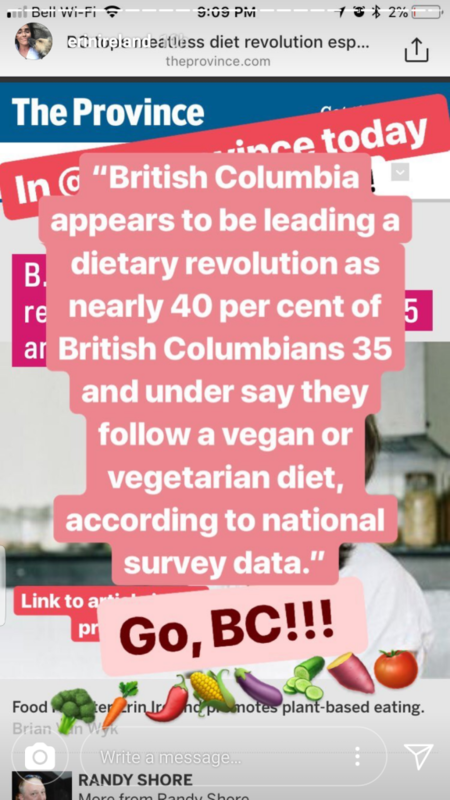 Most people I couldn’t imagine them becoming vegetarian or vegan and when I mention this topic or the latest thing I’ve learned to NPY, he’s staunchly against giving up meat and dairy. Let’s just also say that Erin’s IG (and brand) are pretty persuasive to me. When I first drafted this post to this effect, I had named it “Accidental veganism”. At that point, I had borrowed the Oh She Glows and Thug Kitchen cookbooks, not knowing they are vegan, and a few other cooking shenanigans that were vegan or practically vegan. I bookmarked a lot of recipes of course and one on recipe is the Salted Chocolate Hemp smoothie – okay, not a shining example of vegan cooking, but how could you resist that?? Can I do it? Not right now, full on, and I’m going to cite kid(s) as the excuse. But I can sneak in vegetarian and vegan dishes and ultimately, when it is also so much more mainstream (like the majority?? ), I will surely be vegetarian -ovo-lacto-vegetarian then ovo-vegetarian – and hopefully even vegan. By that time, it would no longer turn heads and I wouldn’t be the first of my circle of friends even. For the time being? How do I give up eggs* and sushi**? Or cheese***? Or ice cream****? No doubt about it – 2018 was an eye-opening year and I have never been so conscientious… about everything! Part of it has been fairly closely following the Instagram feed of a local vegan activist. Part of it is continued plastics bans where straws were the big target last year. Part of it is conscientious eating and consumption becoming more and more mainstream. I’m no trendsetter – however, some of the changes I want to make do make me fee like a trendsetter compared to some of my peers/family. Plastic straw bans came into effect last year and some restaurants moved rather quickly to introduce a chance. Now I feel really wretched using a plastic straw. Recently when we were in California, we encountered paper straws much more frequently than we have in Canada and that experience has convinced me to get some silicone straws. Kiddo does have resusable straws that come with his Take and Toss cups, and he was really upset by paper straws when they disintegrated at his lips and became floppy in the middle. I simply can’t decide which seller on Amazon to buy silicone or stainless steel straws from, and don’t want to buy a six-pack either. I try harder not to be in a position to take plastic bags when shopping and keep a foldable tote (flimsy and small capacity but delightfully vintage as I found it among my late grandparents’ possessions) in my work tote and we keep several shopping tote bags in the car. I’ll throw certain produce naked into my purse, much to NPY’s horror. Our drawer of plastic bags – a whole drawer! not just an overstuffed IKEA plastic bag dispenser – is incentive to be mindful about plastic bags and not packing more in. Further, I hate paying $0.05-0.10 for each one! My mother (and her mother) are the queens of packaging and triple-packaging food in their fridge and freezer. It’s insane and makes me wince inside. My mother has a giant drawer (in her giant kitchen) filled with boxes of ziplock and sandwich bags, rolls and rolls of Saran wrap. When we have leftovers, we have a set of Anchor glass containers and Snaplock (the latter from Costco) that I opt to use. Food will stay fresher with a good seal on the container so I shudder when I see NPY has used our flatware and thrown Saran wrap over it. For Christmas, I asked for Buzzee beeswax wraps which I use sometimes, like when it’s not going to get wet and sticky, etc. The only people I know who bring their own utensils, I thought for a while they are clean freaks. Then I learned that they are trying not to contribute to single-use plastic like utensils. I’m super-conscious of that now and trying to leave a home utensil at work so I don’t use the work disposable utensils (albeit compostable versions now). We don’t eat that much takeout and are not prepared with our own reusable utensil set and we carry in a “diaper bag” IKEA kid utensils (the older translucent version) which he uses at restaurants which have real dinnerware anyhow. Interestingly, when I was talking to my friend about Soap Dispensary, she said she personally wouldn’t bother and wasn’t interested. I think she is looking for bargains you can find at the drugstores and justifies her choice in that when you buy a bottle of personal product or household cleaner, you use it for quite a while and then dispose of the plastic. Soap Dispensary? A former colleague at work told me about it and I visited once with my sister when I didn’t have much to shop for nor did I have an empty plastic or glass bottle to fill. I’m really excited to return and get my first fill(s) of product and use some of those mason jars that are currently just decorations in my cabinet! It’s not like I use body wash dispensed from a plastic bottle but I’m currently off getting a bulk package of Ivory or Dove soap from Costco and instead I’m opting for Alaffia’s Good Soap from Whole Foods (often on sale, if not, it’s 3 for $8) and splurging (or asking for Christmas) on Rocky Mountain Soap. I’m currently using a Rocky Mountain facial bar and have a shampoo bar lined up to use. Next up, I’ll try Lush’s shampoo bar. I love the reduced packaging when buying loose bars of soap! I blogged about using Nellie’s products now and heard from the same former colleague that you can get refills without packaging. Even so, creating their products in powder form means much smaller volume and I agree with that principle and will keep an eye out on their refills in slim packaging. If it isn’t mainstream enough, Canada’s updated food guide released in 2018 reflects the kind of food we should be eating for our health and for the benefit of the planet: increased and a variety of fruits and vegetables, de-emphasis on meats, substitution to more less refined grain products, and no presence for dairy products. I can’t sit through a slaughterhouse video but I can read about it and am now so aware of the unnecessary cruelty on animals so that we can eat meat and enjoy milk and dairy products. Increasingly, I’m conscientious if I am cooking something that is pretty close to being vegetarian or vegan – assisted if I have the ingredients in my fridge or pantry – and before even being conscious of it last year, I made the following: vegan bolognese, egg salad sandwhich, “scallops” (with king oyster mushrooms), breakfast hash with Trader Joe’s soy chorizo… and more to come! Just last week, I finished a trial week of Planted Meals, plant-based (vegan) prepared meals and I would do it again. I mean, it means not having to make lunch for myself all week or even conjure up between the usual choices some crappy option from the food fair in the mall below my office. Speaking of food other people make, the all-vegan restaurants I enjoy around town include Virtuous Pie and Chickpea. Also, I’m finding that I’m often ordering the vegetarian offering when we go for ramen – usually I share a bowl with kiddo who doesn’t like the chashu (that I love) so I may as well get the vegetarian one with a variety of vegetables to offer him. Baby steps and I’m obviously only at the very beginning of this path! * Tofu in things like egg salad and scrambled eggs / chickpea flower patties with Shani’seasoning for fried eggs? ** There might be yummy vegetarian/vegan sushi but no substitute for raw fish!! **** Ice cream has the most viable substitutes.